The Van RepLock is a high security robust alternative for vulnerable manufacturers van locks. These are usually broken into by means of a screwdriver, but the RepLock van security lock addresses this problem. The RepLock van lock has a thick internal reinforcing washer and is secured with a large nut that secures the threaded internal body to the van door. With it's 50mm diameter lock face, the RepLock can usually cover any damage caused by previous break ins. 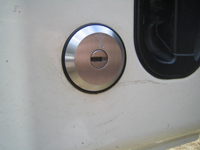 The RepLock van security lock can also be linked to the central locking and offers a good visual deterrent. The van RepLock can also be used alongside the van deadlock for maximum security. The RepLock can be supplied keyed alike at no extra cost. Our expert mobile fitting service means that you can get Matlocks van RepLock supplied and fitted to your van at home or your work place.